A NWRDATF Small Grant goes a long way…! 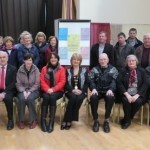 A NWRDATF Small Grant of €1,000 was presented to Easkey Community Council which was used to fund the production and printing of a pocket sized information booklet on drug and alcohol support services in West Sligo. The grant will also go towards the hosting of an alcohol free event on St Patrick’s Day for at risk young people.